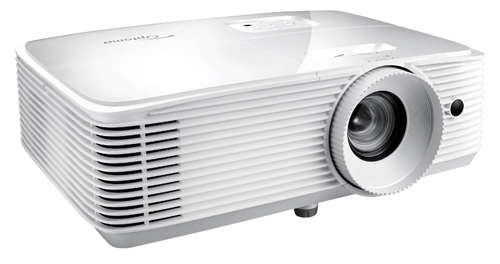 Optoma promotes the WU336 primarily as a conference/classroom projector for medium-sized rooms. That is certainly this projector's target market, but it does a very good job as a video projector as well. So the WU336 shows excellent versatility for many data/video applications. It can also accommodate both wired and wireless sources when equipped with its optional wireless dongle (HDCast Pro for $79). In data presentations, the WU336 resolves small fonts quite well even at maximum keystone settings. Spreadsheets, drawings, and text documents are bold, clean, and distinct. The projector's Cinema mode produces beautiful video with excellent saturation and very realistic flesh tones. We did not need to do much extensive picture control adjustment. A slight decrease in brightness and a small boost in contrast yielded a very pleasing video image that comes close to home theater quality. The WU336's lamp is rated for 3,500 hours of operation in Normal mode. Lamp life is extended to 15,000 in Eco mode. There are two intermediate Eco settings with proportional lamp lives. However, since replacement lamps from Optoma are only $89, there is no significant cost savings to be gained by running in Eco mode. The WU336 has an on-board 10W speaker which delivers sound sufficient for a medium-sized room. Audio quality is very good with no buzzing or rattling even at maximum volume. Additionally, there is an audio output available on the rear panel if you choose to use an external speaker system. The WU336 is Full HD 3D compatible and works with any DLP Link shutter glasses (e.g., Optoma ZD302 for $49). 3D formats supported include side-by-side, frame-pack, and over-under. Last but not least, the WU336's full-size remote is well laid out, and the on-screen menu system is very intuitive. Of particular interest is its screen blanking feature . . . it not only freezes the image, but it also blanks it out so that presenters can comment without distraction. The Optoma WU336 is one of only two 1920x1200 resolution projectors currently on the market for under $600 (the other is the Optoma WU334). Combine that aggressive price with its 3-year warranty and replacement lamps for only $89, and this amounts to outstanding value in today's market for multi-purpose data and video presentation.